AutoCAD command line may look very insignificant to new users but its rather very useful tool and it can increase your productivity in many ways. Here I will tell you about some features of command line that you can use to become more efficient. Command line is an AutoCAD palette and you can change its size by expanding it using your cursor, you can also move this command line by holding top left corner with cursor. By default two lines are visible above command line which show recently entered commands you can expand or collapse its size to shown more or less number of lines in the command history. Sometimes users accidentally turn off command line and then it becomes annoying to find no option for bringing it back. There is a shortcut key combination that can bring it back itsCTRL+9 this key combination can hide or bring back hidden command line on drawing area. On pressing F2 key a pop up will appear above command line with list of all recently used commands and inputs. To insert a command from this list highlight it and then right click a contextual menu will appear select paste to command line from this menu. You can also use UP arrow key to toggle previously used command when desired command appears on command line press enter to select it. 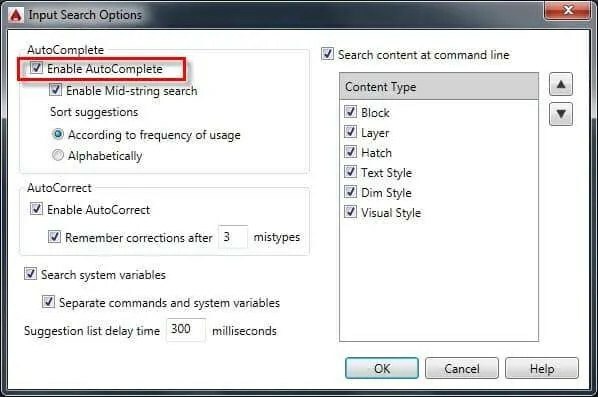 Starting from AutoCAD 2012 there is an auto-complete feature added to AutoCAD, when you type a command you will see a list of suggested commands starting with the letters as you type it and this list becomes more and more specific as you enter more letters in command line. This feature can be great for finding the correct command but if you find this annoying then you can turn it off also. For turning auto-complete off type INPUTSEARCHOPTIONS on command line and uncheck the radio button in Auto-complete panel. You can use command line to search named objects like blocks, layer, dimension style etc directly without looking for them at respective place. 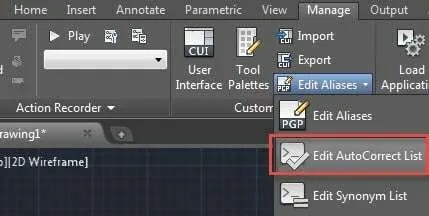 Let’s assume that we have a drawing with a layer named DOOR and a block named DOOR so if you will type DOOR in command line you will see that AutoCAD will suggest you two options one for block and other for layer DOOR. Selecting any named object from command line will make it current object for the drawing for example on selecting DOOR layer from these options it will become current layer. If you want to turn off this search feature then uncheck the “Search content at command line” radio button from input search options window as mentioned previously. If you are among the one who makes frequent spelling mistakes of command then this feature is for you. Go to Customization panel of Manage tab and select Edit AutoCorrect list from the panel, a .pgp file will open with notepad and you can enter your own misspellings in it. For example let’s assume you make a frequent spelling mistake of typing LAYER as LEAR then you can enter this misspelling in .pgp file so that even when you enter misspelling it will enter correct spelling. The incorrect and correct spellings should be entered in a proper order for making AutoCAD understand it the correct method is shown below. Here the first spelling is incorrect and second is correct one. Once you have entered misspellings save .pgp file and exit it. You may need to restart session of AutoCAD for applying these settings.